Check out this How to Apply Edible Images video. Check out this video showing How to Cut and Place Edible Images. 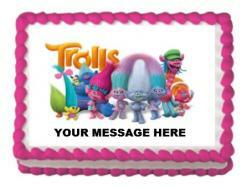 Edible Images Cake Stickers are 100% edible, Orthodox Union Kosher Certified and FDA approved. Edible Cake Stickers can be applied to cakes, cookies, ice cream cakes and other edible goods. They meld to the surface by absorbing moisture from the food item, cut easily after application and are freeze-thaw stable. DO NOT LET WATER COME IN CONTACT WITH THE TOP SIDE OF THE EDIBLE IMAGE BEFORE OR AFTER ON CAKE. Keep your Edible Image in the air tight bag until ready to use. Store in the sealed bag at room temperature away from direct light. Store your finished product as normally required for food safe handling. Edible Image® decorations will not affect the shelf life of your finished product and are freezer, refrigerator and shelf-stable. If you are located in arid or humid temperatures properly storing images is important for optimum application. See the attached information on “Helpful Hints” if you have difficulty. 1. Remove your Edible Image from the white plastic backing sheet. For Rectangle and Strips prints: Gently roll the backing sheet over the sharp edge of a table or counter with image facing up. The image should release off the plastic white backing sheet. Gently peel the edible image off the plastic backing sheet. Do not pull hard on the sheet as they are a bit delicate and could rip. For any difficulty see the attached information on “Helpful Tips”. For Pre-cut round and Square print: Edible images are already released from the white backing sheet. Edible prints are laying on the white plastic backing sheet ready to use. TOPS of cakes or treats: Lay the edible image on top of your cake by holding the ends and gently applying from the middle first, to the ends. Gently smooth out the edible image making sure there are no bubbles and the edges are touching the frosting, fondant, or chocolate to ensure a nice clean look. SIDES of cakes: Apply the first edible imaged strip from the middle first, to the ends. Smooth out using your fingers, making sure all the edges are touching the frosting or fondant. NOTE: before you smooth out the cake sticker make sure it is straight; when applied to frosting you can gently move the image a bit to position in place. When applied to fondant it will stay where you placed it. Place the next strip to match the end of the 1st strips, smooth out. 3. 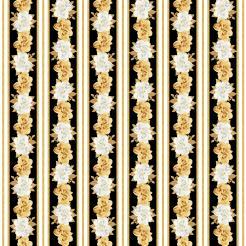 Create some piped borders around the edges or apply festive sprinkles for an added touch. Enjoy all the smiles when you present your special creation! IMPORTANT: Do not let water come in contact with the TOP side of the edible image. It will ruin your print. Once the edible image has been on the cake for about 5 to 10 minutes it will begin to blend with the frosting. Do Not Touch It; it can leave a dent just like frosting does when touched. For the best results apply edible images to a freshly frosted cake. If your frosting has become dry, spray a fine mist of water (do not have puddles of water) on your frosting before applying the edible image. This will add moisture back into your frosting so the edible image can adhere properly. We suggest using a white frosting so your image will stand out better. Using chocolate or a dark frosting can darken some areas of the edible image. If the edible image crease or rips while placing, gently rub the area back together and it hardly shows. 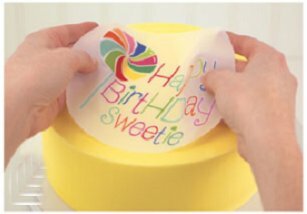 If needed you can trim Cake Stickers with sharp scissors or a razor knife on or off the backing sheet. When trimming strips with a razor blade trim from the bottom up after applying to the cake to avoid tearing. When building tiered cakes, assemble them completely before beginning to apply designs. Keep unused edible images in the re-sealable bag to keep them from drying out. • Roll the sheet (image side up) over the table edge to loosen. • Pop the image in the freezer for 15 to 30 seconds (some images may require more or less time) then try rolling the sheet on table edge again. • Use a Cricut™ brand spatula to carefully separate the image from the backing sheet. Image too soft for placing? 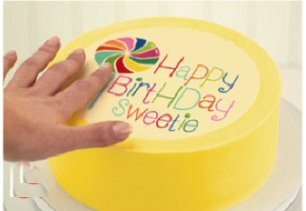 If high humidity or warm hands make the image too floppy to handle, use the backing sheet to transport and slide the image into place on the cake or treat. Worried about smearing ink? In humid conditions, the black ink may smear when applying image. To prevent this, use a piece of the backing sheet to smooth out the surface of a placed image. • Be careful with freeze/thaw cycle of freezer to avoid build-up of ice crystals on frozen product. • If product is decorated and refrozen, make sure packaging is vented to avoid ice buildup. • Thaw finished frozen decorated products slowly, preferably uncovered in the refrigerator, to avoid sweating and color run. • Place a humidifier in the area where you are storing the images. • Place the bag in your proof box, open the bag to capture steam and reclose it. • Open the bag near hot running water, allow steam only to enter bag and then reclose the bag. • Place the single Edible Image® decoration in an airtight plastic container with a warm damp cloth, ensuring cloth does not touch image. Does it bubble after application? Gently tap the image down with fingertips – do NOT rub. Bubbles can occur when the image is applied to over-whipped icing. As the bubbles of air rise to the surface of the icing, the image traps them and forms a bubble underneath. To prevent bubbles, be sure not to over whip icing before applying to cake. Make your own designer cakes and treats quickly and easily! Our beautiful edible image cake sticker prints help you make high end cakes and treats with minimal work and maximum results. See all of our festive edible image cake decals. Check out our pre-made Chocolate Photo and Photo Cookies. Enjoy creating your edible image treats! Enjoy all the smiles you will receive!